Scottish Greens believe that we must use our tax system to fund public services and tackle inequality. Public services such as the health, schools and social care are the bedrock of our society and are widely supported. Scotland can fund these services, tackle inequality and raise more revenue fairly. We propose replacing the discredited Council Tax with a progressive property tax, and using new devolved powers to cut income tax for lower earners while ensuring higher earners pay a fairer share. New income tax powers don’t give the Scottish Parliament full control, but we can use them to create a more progressive system in 2017. 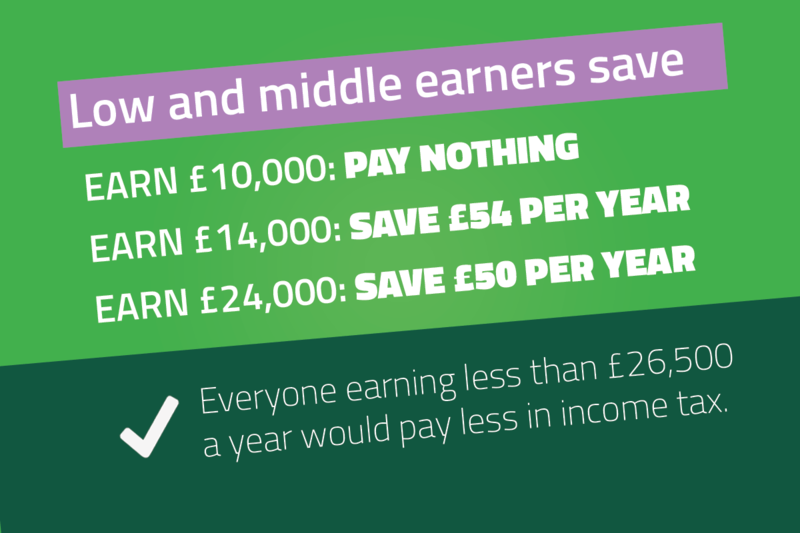 Under Green plans for Income Tax, everyone earning less than £26,500 a year would get to keep more of their pay, while the highest earners would be expected to contribute more. The current Basic Rate of 20% would be replaced by two bands - 18% for the first £7,500 of income above the personal allowance and 22% for income above £19,000. The net effect of these two bands would mean that everyone earning below the £26,500 would be better off. 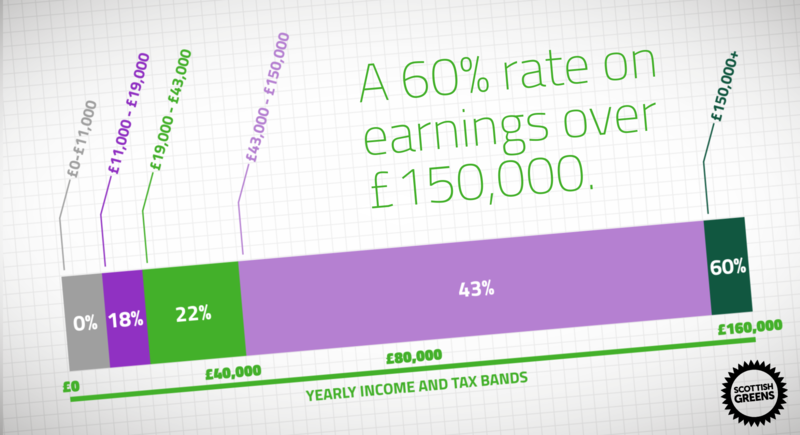 Income above £43,000 would be taxed at 43%, and income above £150,000 would be taxed at 60%. Switching to this system would raise at least an additional £331million to invest in public services, and reduces inequality by four times more, compared to the SNP's proposals for income tax. Someone earning the median salary in full time work - £27,710 - could expect to pay just £24 a year more in income tax. An MSP, earning £60,685, could expect to pay £938 a year more. After 8 years of the council tax freeze there is cross-party agreement that the system is broken. Bold change is needed. It’s time for a fair local tax. We propose to scrap the discredited Council Tax and replace it with a Residential Property Tax. The Council Tax system is now based on valuations a quarter of a century old and the most expensive homes pay only three times that of the least expensive, despite being worth on average 15 times more. 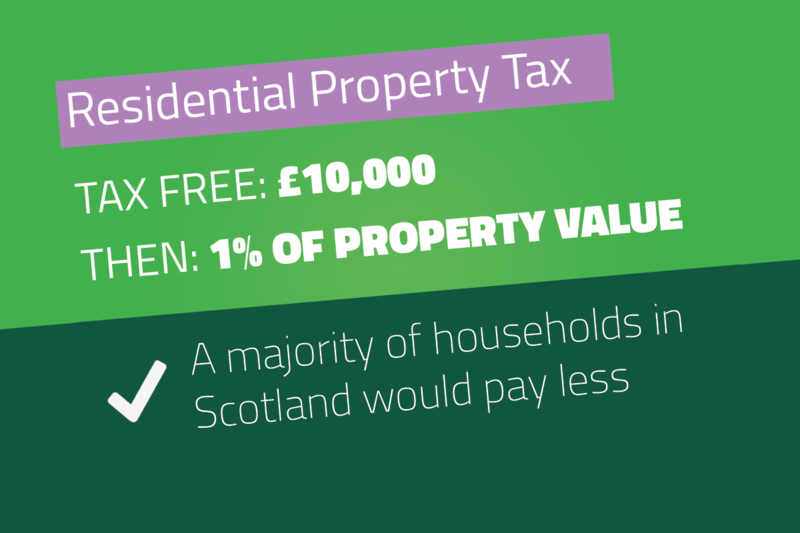 Our property tax is fairer since the tax is more closely related to the actual value of each home and represents a significant step towards our long-standing policy of a land value tax for Scotland. A rate of 1 per cent across Scotland with a tax-free housing allowance of £10,000 for every home would raise an additional £490million for local services. The majority of households would pay less than at present. Councils would have powers to vary this tax locally. The new system would be introduced over a five-year transition period, a tax reduction scheme would be available for low-income households and eligible households could reduce or defer payments as they choose. READ: Seven ways our tax proposals will make Scotland fairier. READ: Our full tax proposal briefing. Non-Domestic Rates. Green MSPs will advocate replacing non-domestic rating (NDR) with a system of site value rating, commonly known as land value tax. This will remove any disincentive for businesses to improve, refurbish and develop existing property. We propose to give councils the power to set the rate for 50% of the assessed value of non-domestic property and review the system of reliefs that currently apply. More details are available here. Air Passenger Duty (APD). APD is worth £250m to the Scottish budget but despite the pressures of austerity current Scottish Government proposals are to cut this tax by half when it is devolved in April 2018. This will damage public services and increase climate emissions. Green MSPs will fight Scottish Government austerity and campaign to retain APD. Land and Buildings Transaction Tax (LBTT). Stamp duty, now known as LBTT, has been improved but it still penalises people who have to move. Instead we will advocate that LBTT is rolled into local property taxation. Basket of local taxes. Greens will continue to argue for changes that empower local government to make decisions that fit local circumstances. We believe councils should have a basket of tax options available to them if they choose - for example, raising funds through an Overnight Visitor Levy or local sales taxes. The revenue from these taxes would be small compared with property, income and non-domestic rates but can provide Councils with vital options to deliver local priorities. People on generous salaries, such as MSPs, deserve to pay a fairer share to protect and improve the public services we all rely on. Someone earning less than the average and struggling with the cost of living deserves to keep more of what they earn.